UDM Downloads > WMV to MPEG4 converter! WMV to MPEG4 Converter is a professional Video to MP4 Converter that can convert video to MP4. It supports all common video format such as XviD, MPG, MPEG, DAT, RM, RMVB, MOV, ASF and so on. This MP4 Converter makes you easily enjoy video on Sandisk, Archos AV500, Archos AV700, Archos GMini402, iRiver PMP-100, Creative Zen Vision, PMP and other MP4 players. 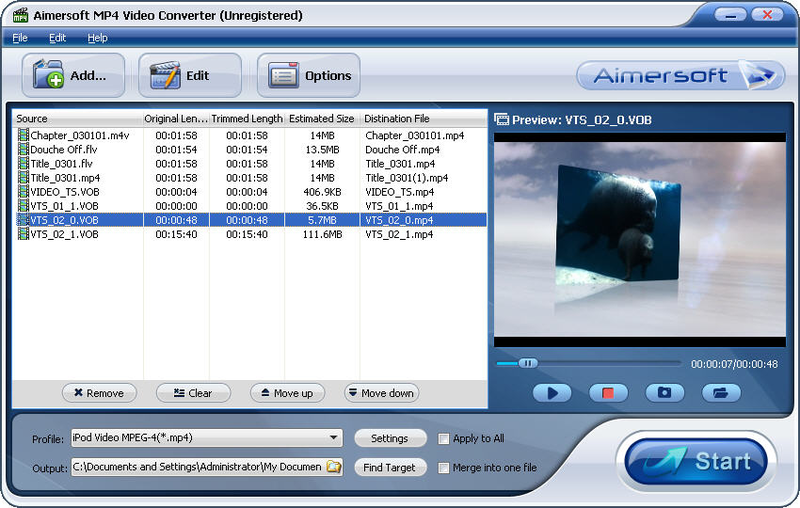 WMV to MPEG4 Converter provides you with a wide variety of functions, such as video cropping, movie trimming, video effect adjustment, aspect ratio selection and so forth. This MP4 Video Converter is also complete with encoding parameter settings to set the resolution, bit rate, frame rate, aspect ratio for you to get the best video and audio quality. It is also a powerful Video to MP4 Converter for you to convert several video clips into one MP4 file. With this Video to MP4 Converter, you can easily convert AVI to MP4, convert MPEG to MP4, WMV to MP4 and so on with excellent quality. WMV to MPEG4 Converter also has a very user friendly interface that lets you finish the conversion with just a few clicks of your mouse. Key Features: 1. Support all kinds of video formats WMV to MPEG4 converter can convert all popular video formats including AVI, MPEG, MOV, MP4, RM, RMVB, ASF, FLV, 3GP, WMV to MP4 format. 2. Powerful editing function Support video cropping and movie trimming. Allow you to cut off the undesired area from your movie video and capture your favorite clips to convert. Allow you to adjust brightness, contrast, saturation, etc. 3. Batch conversion and customizing video profile This MP4 Video Converter supports batch conversion and customizing video profile, You need not click time and time again for setting as once you save your individual setting as profile, make your conversion much easier. 4. Support various output video aspect ratios Support various output video aspect ratios including 16:9, 4:3 and full screen.